Patients with osteoporotic spine fractures can suffer from severe, often life-limiting, back pain, kyphosis (spine curvature), and limited mobility. Vertebroplasty is a percutaneous X-ray guided technique to stabilize the fracture, and alleviate the pain; it was introduced in Europe a decade ago, and is now widely available in the US to treat painful compression spine fractures. Kyphoplasty, is a slightly modified technique that involves placing a balloon in the fractured vertebral body to restore its height, then filling the vacuum created with bone cement. Based on our experience, both procedures are very effective in alleviating pain originating from spine compression fractures. TRA Intereventionalists were among the first to bring this new treatment to Northwest Ohio, and are actively involved in national multicenter research trials to prospectively study the advantages, and differences of both techniques. TIPS is a procedure performed by Interventional radiologist (vascular radiologists) at many major medical centers throughout the country for patients with various complications from their advanced liver disease. Initial work with the placement of TIPS devices in humans was first reported in 1982 by Colapinto but the more modern use of expandable metal mesh stents with significantly improved results was not reported till 1990 by Richter. Since 1990 refinements in technique and a growing experience with the method have made TIPS widely available in many major medical centers, particularly in liver transplant centers. This technique has offered an outstanding treatment alternative to earlier complex operations required to treat these life-threatening complications of cirrhosis. Toledo Radiological Associates (TRA) is pleased to announce a new treatment for unresectable liver cancers, both primary and metastatic. 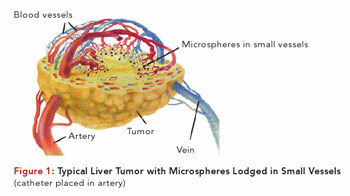 Radioembolization is a minimally invasive liver cancer therapy that consists of the catheter-directed infusion of millions of microparticles containing radioactive yttrium-90 (Y-90). 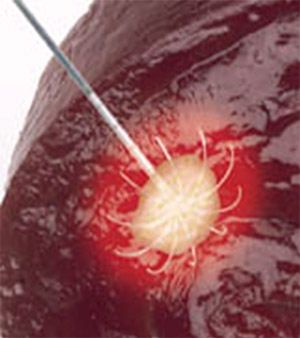 The product (TheraSphere) is injected by TRA interventional radiologists into the hepatic artery through a catheter, which allows the treatment to be delivered directly to the tumor. TheraSphere treatment can generally be administered on an outpatient basis and does not usually require an overnight hospital stay. TheraSpheres, 100% reimbursed by Medicare and many commercial health insurers, are used to treat patients with unresectable primary and metastatic liver cancers and can be used as a bridge to surgery, ablation or transplantation. It can also be used to treat liver cancer patients with portal vein thrombosis. For more information about HCC click here.